Jerry L. McCombs is a member of the Mt. Olin AME Zion Church. There he serves as Preacher Steward, on the Budget and Finance Committee, as President of the Lay Council, sings in the Young Adult Choir and is a member of the Men’s Booster Ministry. On the Statesville District, he is a member of the Budget and Finance Committee and the State of the Church Committee. In the Western North Carolina Conference, he serves on the Board of Christian Education, on the State of the Church Committee, as Chairman of the Board of Lay Activity and President of the Western North Carolina Lay Council. He is also the Retired Connectional Lay Council Financial Secretary, serves on the Restructuring Commission and has been a delegate to the General Conference since 1996. Professionally, Mr. McCombs is in his 37th year at Spectrum Communications. He is active in the community as a member of Victory Lodge # 745 Hickory, NC Prince Hall Mason (F&AM); the Cleveland Consistory #122 Shelby, NC Subline Prince of the Royal Secret, 32 Degree; a worthy Patron for the Pride of Hickory Chapter #519 Order of the Eastern Stars; a worthy Patron at large for the 36th District Order of the Eastern Stars; President of the Catawba County Branch NAACP; NC NAACP Membership Chair; as well as a member of the CatawbaCounty ECCCCM Board; member of Catawba County Emergency Action Committee; Catawba County Carolina Thread Trial Committee; Catawba CountyPlanning; Parks and Development Advisory Committee; Catawba County Transportation Committee; Catawba County Cancer Task Force; Catawba County Relay for Life Committee; Catawba County Historical Association Board; Newton Planning Committee and the Maiden Rosenwald Community Development Corporation Board. Rev. Katie B. Chapman was born in Burgaw, NC. She received her elementary and secondary education from Craven County public schools, graduating from Newbold High School in Dover, NC. Desiring to continue her education, she was led to attend Craven Community College and Shaw University earning a Child Develop Associate Hood Theological Seminary Certificate. She received Deacon and Elder Ordination in the African Methodist Episcopal Zion Church by Bishop Alfred G. Dunston in 1989. Her pastoral experience includes: St. Paul, Aurora; St. John, Turkey Quarter; Alliance Chapel, Alliance; St. Mark, Bayboro; Wesley Chapel, Tuscarora; and presently St. Stephen, Belgrade. She was appointed as North Carolina Conference Director of Evangelism by Bishop George E. Battle, Jr.
Rev. Chapman has been blessed and productive with her life in education lasting over 30 years. Her experience included working with the Coastal Community Action Head Start Program and with the Craven County Public School system. She is an active member of the North Carolina Conference and has served as an administrator with many boards and auxiliaries. As a leader of the conference for the South African Ministry, Rev. Chapman made 5 trips to serve as a leader of the South Africa Board. Rev. Chapman has exercised many spiritual gifts of administration, teaching, preaching and shepherding to bless the ministry to empower others for discipleship. Rev. Chapman is a 3-time delegate to the AME Zion Church General Conference. A native of Knoxville, Tennessee, the Rev. Joel D. Miles was educated in Knoxville’s public schools. He attended Morristown Junior College, the University of Tennessee at Knoxville, and is currently pursuing a degree at DePaul University. In 2013, Bishop Darryl B. Starnes, Sr. appointed Rev. Miles the Presiding Elder of the Chicago District, where he is providing stellar leadership for the seventeen churches of the district. Rev. Miles is a Life Member of the Connectional Lay Council; a Life Patron of the Women's Home and Overseas Missionary Society; and a contributing writer for the "Star of Zion," the official newspaper of the AME Zion Church. Rev. Miles is completing his third quadrennium as a member of the Connectional Budget Board of the AME Zion Church. He is a Regional Vice President (Mid-West Episcopal District) of the International Ministers and Layman's Association of the AME Zion Church. He is an active member of the Presiding Elders’ Council of AME Zion Church. He is also a Life Member of the NAACP. Rev. Miles is the recipient of several awards including the following: the Maryville NAACP Pastor's Award; the TN Colonel Aid de Camp – Governor's Staff Award; the IOTA Phi Lambda Sorority's Bronze Man of the Year; the Wayne County Distinguished Service Award; and Several Spirit of Detroit Awards. Livingstone College awarded him an honorary doctorate degree on May 7, 2016 for his years of service to the AME Zion Church. A native of Brooklyn, New York, Rev. Monica spent 20 years as a member of Varick Memorial A.M.E. Zion Church in Brooklyn, NY where she served in many capacities including: Minister of Music, Youth Minister and an appointment by Bishop W.M. Smith as Associate Pastor. She was appointed pastor of St. Thomas A.M.E. Zion Church in Haverstraw, NY in 1991. She served there until 1996 when she was appointed pastor of Williamsburg A.M.E. Zion Church in Brooklyn, NY. In 2003, she was appointed pastor of Shaw A.M.E. Zion Church in Corona, NY. In March 2010, she was appointed the pastor of her home church, Varick Memorial A.M.E. Zion in Brooklyn NY, where she now serves and continues to preach and teach the Gospel. In additional to her District and other activities, Rev. Marshall proudly serves as the Chief of Protocol of the NY Conference and the Director of NY Annual Conference Mass Choir. She is known for her music ministry, her love of people and her willingness to serve. Vanessa Watt is the daughter of Mrs. Eunice B. Watt and the late Reverend Benson I. Watt, Jr. of Moore, South Carolina. Educated in the Spartanburg School System, Vanessa is a 1982 graduate of Paul M. Dorman High School. She went on to earn an Associate’s Degree in Business from Spartanburg Community College. Vanessa also holds an Associate’s Degree in Biblical Studies and a Bachelor’s Degree in Theology from the Carolina College of Theology. She is presently pursuing her Master’s in Biblical Studies. A member of New Prospect A.M.E. Zion Church, Spartanburg, SC, Vanessa serves as Church Musician, Youth Sunday School Teacher, Chairman of the Steward Board, and Deaconess. On the District level, she serves as the YACM Director, Christian Education Department and the Treasurer. On the Conference Level she serves as President of the Home Missions Department, Palmetto Conference. She was elected a delegate for the 2012 and 2016 General Conferences. Vanessa also serves as a Connectional Trustee. She is presently employed Human Resources at Piedmont Community Action, Inc., and also works with the Head Start / Early Head Start Division of Piedmont Community Action, Inc., in Spartanburg, South Carolina. Melva Polk Wright is a native and lifelong resident of Salisbury, Maryland. She is a 1982 graduate of Towson University in Towson, MD with a Bachelor of Sciences degree in Elementary Education and a 1990 graduate of Salisbury University with a Master of Education degree in School Leadership. She is the mother of Mallory Paige, a recent M. Ed graduate of Johns Hopkins University, doctoral student at Morgan University, and Jenna Renee', a 2018 graduate of Livingstone College. Both daughters served as national officers of the Varick International Youth Council. Melva has been a member of the St. Paul A.M.E. Zion Church, Salisbury, MD for all of her life. At St. Paul, she serves as the Music Coordinator, the Secretary of Youth, WH & OMS, and the Quarterly Conference Secretary. At the District Level, she is the District President of the Women's Home and Overseas Missionary Society, Eastern Shore District, Philadelphia Baltimore Annual Conference. Previously she served as the District Secretary of Youth, Superintendent of the Buds of Promise and Secretary of Supply. Melva has attended all Missionary General Conventions since 1983. She has also attended the CED General Conventions in 2006, 2010, 2014 and 2018. She has participated in the General Lay Conventions in 2009, 2013 and 2017. Melva has also served as a delegate to the General Conferences of 2004, 2008, 2012 and 2016. Melva is currently a candidate for the office of General Secretary of Youth, WH & OM Society. Professionally, Melva currently serves as the proud principal of the newly opened West Salisbury Elementary School. Melva was a driving force in her community that brought about the construction of a new school in her community. She has served as a school based administrator for 29 years of her 37 year career. Melva is driven to make certain that we plan for the future. So succession planning is key. Her life is guided by the scripture Jeremiah 29:11 "For I know the plans I have for you", declares the Lord. "Plans to prosper you and not to harm you, plans to give you hope and a future." Mr. Willie Landrum has served in various capacities in the A.M.E. Zion and A.M.E. church and has served ecumenically with many other denominations and organizations. Mr. Landrum has been a member of Metropolitan A.M.E Zion Church, Birmingham, AL, North Alabama Conference since 1993. He joined while then pastor, now Bishop Darren B. Starnes, was the Pastor. Under Bishop Starnes’ leadership, Mr. Landrum served on the Stewart Board, was a Co-Class Leader, in the Sons of Varick and a Local Lay Council member. He served as Conference and Episcopal photographer under the late Bishop Richard K. Thompson and Missionary Supervisor Georgia McNair Thompson. He serves under the currently pastor Rev. Joshua Johnson. While living in San Francisco, Mr. Landrum found his passion for photography and has used that gift in many ways to document church, civic and community events. He describes this work as the Ministry of Documentation. Crediting Bishop Thompson with giving him his first photography job in the A.M.E. Zion Church, Mr. Landrum has worked with many Episcopal leaders as well as other auxiliaries of this denomination. This connection also afforded him to opportunity to work with the Star of Zion where he has found memories of working with the late Mr. Mike Lisby and his widow, current Editor of the Star, Mrs. Adie Lisby. He is the Alabama/Florida Episcopal District Photographer. Rev. 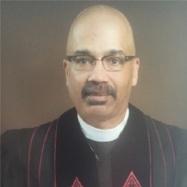 Dr. Moses E. Thompson is the Presiding Elder of the Jackson-Panola District in the South Mississippi Annual Conference, Pastor of Lee’s Chapel A.M.E. Zion Church in Canton, Mississippi and serves as the Southwestern Delta Regional Vice President of the International Minister’s and Lay Association. He is a Member of Zion Chapel A.M.E. Zion Church, the Madison County Ministers Association, the Mississippi and National Funeral Directors & Morticians Association, the NAACP, and a 32degree Mason and Canton Lions Club. Professionally, he is the Manager/Funeral Director at Family Memorial Funeral Service in Canton, Mississippi. He is active in his community as Chairman of the Board of Directors for G. A. Carmichael Health Clinic, Vice President of the Canton Public School Board of Trustees, Canton Boys & Girls Club and Farmhaven Volunteer Fire Department. Rev. Dr. Thompson is married to Tesha Harris-Thompson and they have three children: Nishawandia, Ashley & Keria. Dr. Sheila Quintana is an Oakland native and a product of the Oakland Unified School District. She attended Occidental College in Los Angeles where she received her B.A. degree and Lifetime Teaching Credential. She received her Administrative Credential in 2005 and her Masters in Educational Leadership from California State University, East Bay in 2007. In 2015, she received a joint doctorate in Educational Leadership from University of California, Davis and Sonoma State University. As an administrator, she was the assistant principal of Calvin Simmons Middle School in Oakland, CA, principal of Havenscourt Middle School in Oakland, CA, the principal of Solano Middle School in Vallejo, CA, and the principal of Berkeley Technology Academy (BTA) in Berkeley, CA. Dr. Quintana is currently the very proud principal of Vallejo High School in Vallejo, CA. She oversees 1500 students, five vice principals, 80 teachers, and 30 support staff. Her goal is to take the many challenges facing Vallejo High and use them as guides to move the school back to the greatness it owned in the community as its flagship high school. In The African Methodist Episcopal Zion Church, she serves on the Connectional Trustee Board, the Codification Commission, which oversees the Book of Discipline, the Site Committee, and the Compilations Committee. During 50th Session of the General Conference in 2016, she served as the Chair of the Secretariat. In the Western Episcopal District and the California Annual Conference, she serves a District and Conference Trustee. In her home church, Kyles Temple AME Zion in Vallejo, CA, she serves as the chair of the Trustee Board, Lay Council Membership Chair, and as a consecrated Deaconess. Portia T. Jacobs is the daughter of Mrs. Connie Blanks Jacobs and the late Rev. Thomas T. Jacobs, Jr. of Riegelwood, NC. Educated in the Columbus County School System, Portia was a 1993 graduate of East Columbus High School in Lake Waccamaw. She went on to earn a Bachelor of Science degree in History from East Carolina University in Greenville in May 1997 before beginning a career in education. Making the transition from classroom teacher to school counselor, Portia received a Master of Arts degree in School Counseling from North Carolina Central University, Durham, in July 2004. A lifelong member of Mount Pleasant A.M.E. Zion Church, Riegelwood, over the years, Portia has served her beloved Zion in a number of capacities from the local church to Connectional officer. She is currently serving as as Cape Fear Conference and Eastern North Carolina Episcopal District Director of Christian Education. Connectionally, she serves as a Regional Director of the Connectional Lay Council and a Regional Vice-President of the International Ministers & Lay Association, representing the Central South Africa Episcopal District with both bodies. Honored to have been elected by her fellow laypersons, Portia served as a delegate to the 2004, 2008, 2012, and 2016 General Conferences and has served as the lay representative from the Eastern North Carolina Episcopal District on the Connectional Budget Board since July 2008. Professionally, Portia is a member of the North Carolina Association of School Counselors, the North Carolina Association of Educators and the National Educators Association. She is also a member of Delta Sigma Theta Sorority, Inc.
Ruth E. Gough a native of Boston, Massachusetts and a life-long member of Columbus Avenue A. M. E. Zion Church. Sis. Gough has served as a Local Missionary President, Steward Board member, Sunday School Teacher, Class Leader, Secretary of the Y's, Choir member, and Usher Board member. She has served for many years as the District Lay Council President and a member of the District Planning Board. As a member of the New England Conference, Sis. Gough now serves as a Lay Council Conference President, Conference Trustee, and a member of the planning and finance committee. Sis Gough has been a five-time delegate to the General Conference and a member of the following administrative Boards: Christian Education, Worship, Harriet Tubman and now Research. Sis. Gough has an undergraduate degree in Sociology and Urban Planning from the University of Massachusetts and a Master of Social Work from Boston University. Sis Gough has spent over 30 years as a Social Worker for the State of Massachusetts and as a Behavioral Social Worker at McKinley High School, a special needs Boston Public High School. Sis. Gough is the proud mother of Ms. Priscilla Gough Grinage and Mr. Christopher J. Brookens, the aunt of Mr. and Mrs. Charles C. Banks, Miss Angel E. Banks and Great Aunt to Zoey R. M Banks. The Rev. Dr. Dowdy is the Pastor of the Holland Chapel A.M.E. Zion Church where he has served as the pastoral leader since July 2010. While at Holland Chapel he has lead them in the establishment of a 501c3 nonprofit ministry, Spreading Hope, Inc. Spreading Hope, Inc. is an after school tutorial for at risk children in grades K-3. He and the congregation are active in health and wellness, social activism/political, prison, nursing home, homeless, feeding and other ministries. While pastoring in Fayetteville, N.C., Dr. Dowdy was honored as being one of the very few clergy in the history of Fayetteville to receive the key to the city. He is a former City of Fayetteville police office (SWAT) and a retired military officer. Professionally he has served as adjunct professor at the Mount Olive College for four years where he taught undergraduates the Old and New Testaments and Ethics. He is the chairman for the Durham District Course of Study and a Conference Examiner for the Central North Carolina Annual Conference and an Instructor for the Eastern North Carolina Episcopal District of the AME Zion Church. He has also taught at the Denomination's Connectional levels - Nationally and Internationally. Dr. Dowdy serves on the Holy Order Committee of the Central North Carolina Annual Conference. Dr. Dowdy is a charter member of the Duke/ AME Zion initiative in clinical research, of which he is a member of the executive committee. Dr. Dowdy was selected and agreed to join the Duke Clinical & Translational Science Institute (CTSI) Community Engagement Core Coumminty Advosry Council.